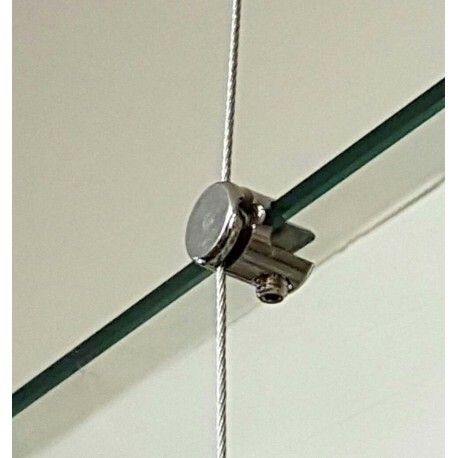 Cable Display Shelf Support Single can hold any size glass up to 6mm,8mm,10mm thick .This steel wire rope clamp even allow you to add new shelf between two exiting shelves without removing or even disturbing the things on top and bottom shelves. High Quality Made glass clamp with Brass Polish Chrome. Cable display shelf support for up to 10MM thick glass. No more holes in the Glass. You can add and remove shelves in suspended shelf system without un screwing. Just slot in the cable and tight the screw. This support even allow you to add new shelf between two exiting shelves without removing or even disturbing the things on top and bottom shelves. This is the best selling hanging shelf clamp in the market.